Okay, it’s a terrible title. But hopefully you get the point; Bandon Dunes’ fourth course is set to battle its siblings for top honors not only at Bandon, but also in Oregon, the rest of the US and beyond. It may seem a little premature given that it doesn’t open until June 1st, but you are strongly advised to get on the phone and book your tee-time for Old Macdonald, the fourth course at the Bandon Dunes Golf Resort on the Oregon Coast, as soon as possible. You’ll be wanting to make those reservations because: 1) In the time it takes you to read this article, half a dozen or so spaces on the tee-sheet will have been filled, and 2) If early reports are to be believed, Old Macdonald is set to attract the near-universal acclaim that it nearest neighbors did and could, eventually, outrank them all. Those that have visited the Bandon Dunes Golf Resort will know just how good that makes it as the three originals; Bandon Dunes, Pacific Dunes and Bandon Trails, all appear in the top 15 of Golf Digest’s rankings of the nation’s top public courses, with Pacific Dunes beaten only by Pebble Beach. Ten holes of Old Macdonald have been open since April last year. 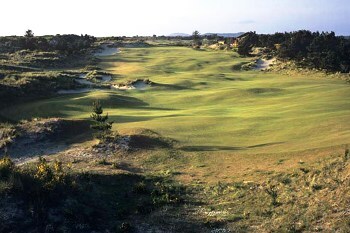 Judging by the photographs that have appeared on the internet, and by what those that have been fortunate enough to preview it have said, the crumpled undulating dunes over which the course was built are every bit as favorable for compelling and entertaining golf as those elsewhere on the 2,000-acre property. It was designed by Renaissance Golf’s Tom Doak and Jim Urbina who had worked so effectively together in creating the fantastic Pacific Dunes which opened in 2001. They were instructed by the resort’s owner, Mike Keiser, to build a course in the style of Charles B. Macdonald, a Chicagoan by birth who much admired the great links courses of the British Isles and who tried recreating their most admirable qualities back in the US. In doing so, he came to be regarded as the father of American golf course architecture. Among his most notable designs are Piping Rock in Locust Valley, NY, Mid-Ocean in Bermuda, the Yale University Golf Course, and the greatest of them all; the National Golf Links of America where he collaborated for the first time with Long Island, NY civil engineer Seth Raynor. Here's an excerpt of an article about Old Macdonald that appeared on Cybergolf.com in January (reproduced with permission). The debut of Old Macdonald, Tom Doak's second design at the Bandon Dunes Golf Resort in southwest Oregon, can't come soon enough for an ailing golf industry. Six months from now, the fourth course at Bandon Dunes will open and, for a moment at least, all will feel right with a world beaten down by recession and largely deprived of great new golf courses. Modeled on the historic designs of Charles Blair Macdonald, the man regarded as the "Father of American Golf Course Architecture," Old Macdonald will shine in an already dazzling corner of the golf world as it fits in alongside a trio of famed siblings: the eponymous Bandon Dunes, which David Kidd wrought from a sea of gorse, Tom Doak's Pacific Dunes, which certainly wasn't the 48-year-old visionary's first design but which trumpeted his arrival as one of the game's most talented designers; and Bandon Trails - Bill Coore and Ben Crenshaw's heathland classic that opens and closes with a couple of links beauties but which saunters through a forest of manzanita, hemlock, white fir, and cedar for most of its enthralling journey. Each of these three layouts is so good, they all appear in the top 15 of Golf Magazine's most recent ranking of the country's top public-access courses, and during your stay you're every bit as likely to encounter golfers who say Trails is the pick of them as you are those who insist the original is still the best. It is Doak's 2001 design of Pacific Dunes that invariably edges out the other two in most publications' rankings, however, placing first on Golf's 2008 list of Top 100 Courses You Can Play, and No. 2, behind Pebble Beach, on Golf Digest's 2007 register of America's 100 Greatest Public Courses. If early indications, such as the already-full tee sheets, are anything to go by, Old Macdonald will waste little time in throwing its hat into the rankings' ring by joining its near-neighbors at the top of the tree. Indeed, as of early January 2010, there are more rounds booked at Old Macdonald for the year than any of the other courses. "That's pretty unbelievable," says Doak, who resort-owner Mike Keiser rehired for the task of building course No. 4. "From the beginning, we said that if the new course winds up with 25 percent or 26 percent of the play at the resort, then we will have done something we can be proud of. So far, the reaction from people who have played the first 10 holes (available for preview rounds since last April) is much stronger than that. I really didn't expect people to tell me they thought it was the best course of the four. I'm sure some of that is just the excitement and the novelty factor of having another course to play, though." Returning to the Oregon coast, site of his most critically acclaimed work to date, was an easy decision for Doak even if he harbored one or two minor reservations over the concept of the new course. "On one hand, going back to work in Bandon was the easiest thing we've ever done," he says. "We are so comfortable in that place and with all of the people there: Mr. Keiser, Ken Nice the superintendent, everybody really right down to the wait staff who serve breakfast. It's pretty much a second home to me and to all my associates." On the flip side, however, Doak says creating a layout in the style of a designer who has been dead for 70 years presented a unique challenge. "It was a very unusual job," he says. "To start from the very beginning, and design a course with a different theme and style from our own was tricky, especially with Pacific Dunes so close." Macdonald was born in 1855 to a Scottish father and Canadian mother in Niagara Falls, Ontario. He grew up in Chicago and studied at St. Andrews University in Scotland from 1872 to 1874, discovering golf for the first time and quickly becoming hooked. After his return to Chicago, he became a wealthy stockbroker but had nowhere to play. New York's "Apple Tree Gang" would not get together until 1888 and the game did not really take hold in the new world until the mid-1890s. In 1892, Macdonald built an 18-hole course - the first 18-holer in the U.S. - in Belmont, 20 miles west of downtown Chicago, and a year later the Chicago Golf Club was born. In 1894, the members uprooted and headed for a 200-acre parcel in Wheaton that Macdonald had chosen because it reminded him of the "Auld Country." There, he modeled many of the holes on those he had played in Scotland, preferring their bold, natural look to that of the tedious, straightaway holes Scottish and English immigrant pros were being paid $25-50 to stake out in an afternoon elsewhere in the U.S. In 1900, Macdonald left Chicago for New York, where he grew ever more frustrated with the unimaginative designs he saw. Starting in 1906, he began "gathering" 70 founders, each of whom contributed $1,000 for the construction of a new course on Long Island that Macdonald hoped would share many of the great features and attractive characteristics of the British links he thought so highly of. The first rounds on the National Golf Links of America were played in 1909, with the club officially opening in 1911. Its holes, though not direct copies, were clearly inspired by some of the best in Britain: the 3rd a nod to the 17th at Prestwick; the par-3 4th a superb version of North Berwick's Redan hole; the 7th a treacherous adaptation of St. Andrew's Road Hole. "Macdonald was a classicist who revered the great courses of Britain," says Doak, "His approach was not just to wander around the land and try to find the best holes he could; instead, he had a short list of what he considered to be ideally designed holes, and he tried to find the right spots on each property to build new versions of them." Doak's starting point was to go back to the roots of Macdonald's thinking, rather than simply study the holes he, and his protégé Seth Raynor, had built. Having played all of his "copies," Doak is well aware that Macdonald's Redan holes and Road Hole renderings were not all the same, and that some diverged slightly from their Scottish roots. "That gave us license to do the same," he says. "So we weren't building 'replica' holes per se; we were replicating Macdonald's process and trying to find good places to build another version of the holes he admired." One advantage Doak had over Macdonald, in addition to bulldozers, computers, and Keiser's generous financing, was the extraordinary talents of associates Jim Urbina, Brian Slawnik and Bruce Hepner, each of whom has between 10 and 20 years' experience building golf holes. "With them around, it would have been silly to build the same simple geometric forms (rectangular greens and bunkers) that Macdonald did, specifically at Chicago. I decided if Macdonald had had those guys to work with, he would have done things differently, and tried to make his golf course in Bandon look more like the original links courses." The result is probably not what people are expecting, says Doak, who adds that if a member of the Chicago Golf Club were standing on the 1st tee not knowing the course's name, he probably wouldn't see the connection. "But when that Chicago member walks on to the first green, a huge backwards 'L' shape with plateaus at the front left and back right, he would feel at home right away because Macdonald built a green like that on nearly every course he built. At the next hole, a Par 3, he would see the flag stuck right behind a nasty little pot bunker, and if he'd ever been to St. Andrews, he would instantly know where that idea came from." Just reading Doak's words quickens the pulse of the devoted golfer who can no doubt picture the rumpled fairways, the oversized greens (one of which is 18,000 square feet!) and the type of tight, sandy turf off which the purest, most responsive contact is made. Geoff Shackelford, author of 10 books - most on the subject of golf course architecture - and an architect himself who has collaborated with Gil Hanse, a former Doak associate, is confident Old Macdonald will be a popular alternative to Bandon's other treasures. "I'm sure it will be very well received," he says. "It sounds like it's going to be great fun. I'm for anything that gets people better understanding and appreciating the old architects. Being a 'theme' course celebrating the work of C.B. Macdonald and Seth Raynor, it will certainly do that." When to go: Summer and early fall are the best times to visit Bandon, but also the most expensive times to visit Bandon. If you can afford it, avoid the winter months as the weather can turn pretty hostile. Mind you, some folk prefer taking on a links with the elements in full effect (in some sort of breeze at least) and can take advantage of more affordable green fees and lodging rates. If you were there this winter and played during one of those beautifully bright but chilly days we enjoyed in February and March, you definitely lucked out. Who to go with: Bandon Dunes is a golf resort, plain and simple. There is no shopping mall or spa for ladies, no water park for kids. The walking trail and fitness center (where you can get a massage) are really the only places you can go to get away from golf. It is therefore best experienced with your three best golfing buddies. You can tee it up together, stay in one of the Lily Pond rooms (thus splitting the $360 nightly rate four ways) and head over to McKee’s Pub in the evening or down to the Bunker Bar for poker, pool and whiskey. Green Fees: A resort guest pays $220 for any of the four courses between May and October. The fee ranges from $75 to $165 outside of those months. It is $25 to $55 more for non-resort guests. Getting There: Click here for map. The drive from Bellingham takes about nine hours. Caddies: Though not mandatory, any one of Bandon’s 300 or so caddies will enhance your enjoyment of the round by giving you the correct line off each tee and a good read for your putt. Plus they might tell you an amusing anecdote or two, like the one I heard about PGA Tour player Kirk Triplett shooting 84-64 on his first visit to Pacific Dunes, or the one about the gentleman who hit his ball an estimated 188 times but, with penalty strokes, was unlikely to have kept it much under 250.